Sarpa Salpa are gearing up for the release of their new single Casanova which is out on Valentine’s Day. 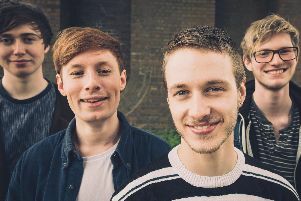 The indie quartet from Northampton are showing little signs of slowing down after busy 2018 saw them play more than 80 gigs including 20 festivals in the UK and overseas dates in France and Germany. The band wrapped their busy summer tour up with a show for BBC Introducing at The Big Festival before heading indoors in the autumn prior to more live shows. In October, Sarpa Salpa released their first proper single Smith on both digital and vinyl formats which saw them pick up airplay over the regional BBC Introducing network, Amazing Radio and from BBC 6 Music’s Steve Lamacq and Chris Hawkins. Wrapping up 2018, the band were invited to play BBC Introducing Live at Tobacco Dock and they finished up the year with a small Christmas Tour hitting Hoxton, Northampton and Bedford, the latter two both sell-out shows. Latest single Casanova highlights the high standards people have when entering new relationships and how expectations can get in the way of connecting with people for who they really are. The accompanying video sees the band each play very different characters was shot and directed by legendary NME photographer Andy Willsher. It will be released a week before the digital version.